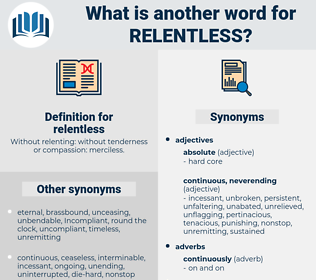 What is another word for relentless? Without relenting: without tenderness or compassion: merciless. unrelenting, unremitting, implacable, pitiless, persistent, ruthless, unforgiving. constant, fierce, brutal, continual, sustained, continued, non-stop, callous, harsh, continuing, steadfast, steady, ongoing, tough, unrestrained, unending, cruel, unwavering, vicious, ferocious, intense, unstinting, vigorous, savage, all-out, bitter, unbroken, perpetual, stone-cold, grim, dogged, earnest, unfailing, painstaking, hard, prolonged, assiduous, uninterruptible, dire, concerted, resolute. 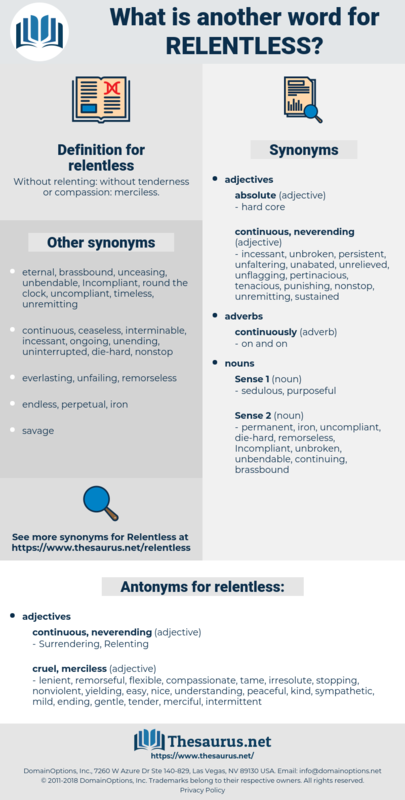 tireless, incessant, merciless, ceaseless, untiring, inexorable, unceasing, indefatigable, strenuous, remorseless, unstoppable, continuous, stubborn, endless, heartless, unabated, uninterrupted, never-ending, tenacious, obstinate, unswerving, insistent, diligent, hard-hitting, unflagging, consistent, intractable, severe, intensive. lenient, remorseful, flexible, compassionate, tame, irresolute, stopping, nonviolent, yielding, easy, nice, understanding, peaceful, kind, sympathetic, mild, ending, gentle, tender, merciful, intermittent. bland, placable, tractable, indulgent, invertebrate, affable, pliable, sporadic, weak, sweet, spineless, obliging, complaisant, slack, pliant, soft, slackening, softening, impotent, genial. His hands still held hers, and strangely there was something sustaining as well as relentless in their grasp. Before Jews could record their suffering, the oppressor's hand again fell, its grasp more relentless than ever.